A descendant of Bubblegum, Big Bud and Skunk1, this variety is distinctive, sweet flavor fruity chewing gum and strong sofa effect. 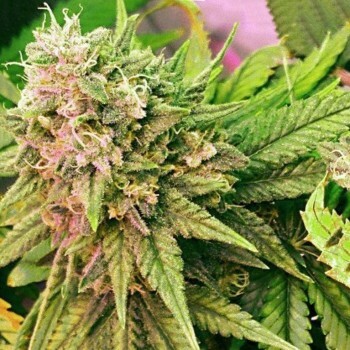 In it is dominated by Indica genes, but also felt a touch of Sativa. That allows you to not just relax but also to enjoy life. That is in addition to sedative effects, Bubblelicious also well relieve. Bubblelicious is not very tall plant, but it is very branchy. The leaves are broad, dark green – give indica genes. During flowering shrubs covered with a carpet of delicate pink flowers that glisten with resin. All this beauty is very fragrant, and requires a good filtration of the air in the room. Babelicious suitable for growing indoors, greenhouse and outdoors. However, in the growbox for the bushes will be more convenient to care for. Because the cultivation of this variety requires certain skills. Marijuana bushes like enough space, so you should not plant them close to each other. Also plants need timely watering and plenty of light. Do not interfere, and periodic fertilizing. If You planted Bubblelicious on the street, be prepared for harvest at the end of September. Growers say that once a week the color will give a more fruity taste to Your crops.